The opportunity to go sailing on a semi regular basis, isn't as elusive as it may seem. Sailtime makes it more available to more socioeconomic classes. Sailtime is a boat sharing company that makes sailing more available and affordable to everyone, thanks to the company's business model. CHICAGO - Sailing is now available to more socioeconomic classes than just the rich, thanks to a sharing business model. Sailtime Chicago is a shared boat membership company. Ryan Remsing is the Fleet Manager. He says the way it works is people pay for a season of using a boat. They have no ownership stake. They just pay for their time. They schedule time online, show up to the boat and it's like they own it. The boat is clean and ready to go with all the safety gear the sailors need. Remsing says the members just have to start up the engine, have their fun, bring the boat back and clean up any mess they may have made. Remsing, who started out in the business while he was a college student, scrubbing decks and doing various chores, knows the members and explains how the program works making sailing more affordable to those who aren't necessarily rich. Boating is very expensive, Remsing says, especially for the higher level boats Sailtime offers. He adds that with a Sailtime membership package, the buyer has a lot of variability in the package they can choose, with options from $3,700 to $13,000 dollars. The price includes insurance, slip fees and gas, making it all-inclusive and easier to budget. The program also makes initial boat ownership easier on the owner. Every boat in the Sailtime fleet is owned by a single owner. The owner puts their boat in the care of Sailtime. 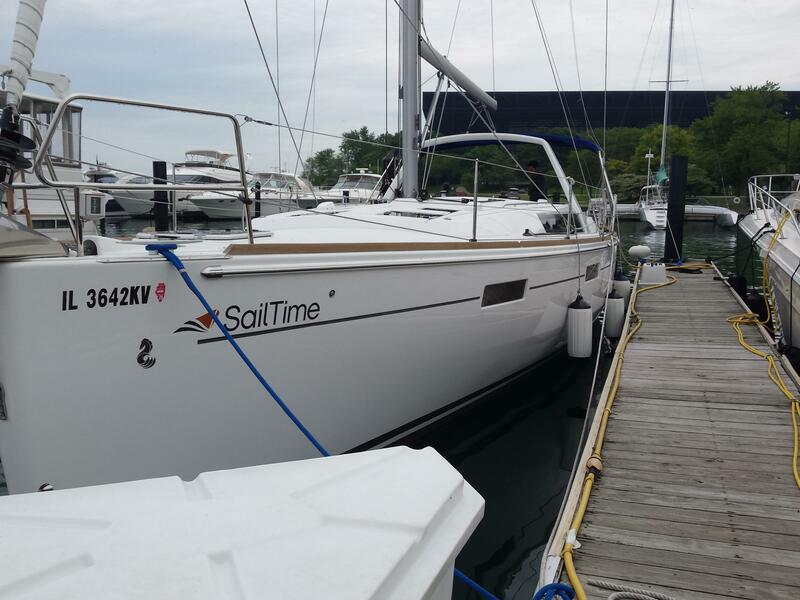 Sailtime then takes care of the maintenance of the boat for about the next five years, including the engine maintenance, maintaining the sails, winterizing it in the fall and getting it ready in the spring. Remsing says it works great for the boat owner because they are getting to sail, they still have their boat and they get a long intro into becoming a boat owner. After the five or six years the boat owner has gotten to know their boat well and has become educated by Sailtime in boat ownership. Remsing says they also saved thousands of dollars in that time and didn't have to do the work of boat ownership. Sailtime benefits by taking in revenue (from the memberships) and Remsing says the company shares the revenue fifty-fifty with the boat owner. The money the owner gets helps cover the cost of their insurance and the slip for the boat. The revenue on top of that the owner can put towards their boat loan, while not having any operational or maintenance costs. Sailtime Chicago also offers an educational component. Remsing's father is the owner of the business, which started in 2005. Remsing, who is now 33, became a sailing instructor when he was 25-years-old. Remsing says Sailtime is an ASA (American Sailing Association) certified sailing school. When members start with the company, they get some basic training that will get them comfortable with taking a few friends out for the day. Every member gets a full one-day checkout on their boat, so they know where all the safety gear is and learn the locations of the Thru Hulls, which is a fitting that is attached through the Hull of a boat. Sailtime also offers advanced courses, which Remsing says would prepare someone for an overnight lake crossing. ASA 101 Basic Keelboat, Remsing says, is the minimum a person should have to be able to go sailing. Sailtime offers that as a two-day course on one of its boats to a maximum of four students at a time, so everyone get's a lot of hands on experience.